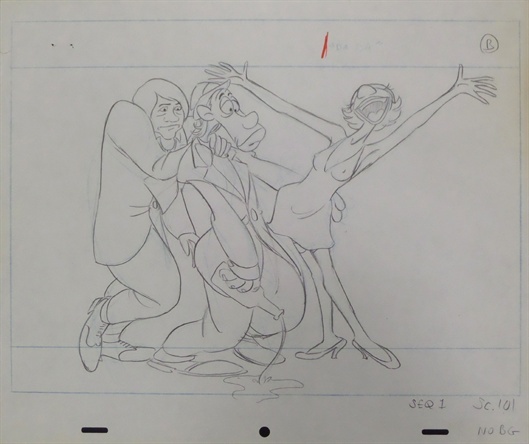 Updated 7/19/2015 This is an original production drawing created for the 1973 Ralph Bakshi production of Heavy Traffic. The drawing features Michael and his Mom. The animation sheet measures 10.5"x12.5". The drawing is in great condition with minimal amounts of edge wear and some light discoloration to the right edge of the sheet. Please note, the upper left corner has a few tack marks from use during production. The piece contains production notation along the bottom edge. The dialogue "Scuse me a Second" is written above the characters along the top edge. This is a beautiful and clear drawing from what is often considered to be Bakshi's most critically successful film.